Early Grids of Milton Keynes, Coffee Hall. The new city started to display its first housing grids between Bletchley and Central Milton Keynes during early 70s. Some of the first housing developments and unfortunately some of the first casualties of badly built building fabrics and ’social’ problems due to wrong allocation policies and mass import of problem tenants from London and Birmingham slum areas also took place at this initial stage. Coffee Hall grid (along with Netherfield and Bean Hill) was one of the earliest grids to be developed. The layout was a refined exercise in organizing a highly ordered and disciplined grid in and around existing landscape features. One and two storey terraced houses to Parker Morris standards were provided in fair faced concrete walls with flat roofs at fairly low housing densities. Coffee Hall never recovered from a disastrous start with a reputation of a failed estate in almost all aspects. The original housing saw some immediate changes to cure leaks and condensation and the empty spaces left un-built around the rigid geometric grid were soon filled in by badly designed housing, which I find too painful to photograph to this day. 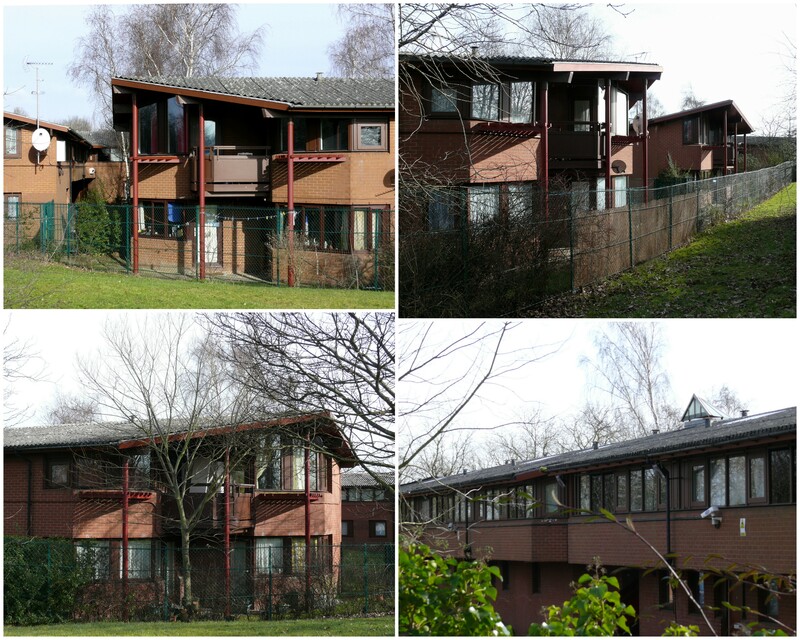 The housing was built to generous Parker Morris space standards but built during a shortage of reasonable building materials and tradesmen. Leaking roofs and condensation started to plague the estate right from the day one. Note the retention of existing hedges. A loving tribute to Corbusier was offered by the MK architects but for obvious reasons Villas were not on offer. However a church was perfectly in order. Unfortunately even this little modest offering has suffered by thoughtless additions. This remains one of the few buildings worth a visit in this area. White paint is now cream and the grass mound has been replaced by an unsightly curved roof building. MacCormac & Jamieson produced this noteworthy housing for single people in 1975-77, when this slide was taken. Even in the present state of poor upkeep, the building sits on site comfortably and retains its poise to enhance a depressing area. The northern part of the grid was reserved and planned for Woughton Education Campus to house three secondary schools, a Roman Catholic school, school annexes, a sixth Form College and a joint use recreation centre. According to the Head teacher of the Campus,” Woughton ward is among the 10% most impoverished in the country and the catchment area is the most deprived in MK” The odd juxtapositioning above illustrates a competition winning low cost private housing scheme by Andrew Sebire & Kit Allsop built in 1982 , described by them as architectural equivalent of the Citroen 2CV. No one imagined that one day it will be pitched against the juggernaut of an Academy next door. The grassed area on left is surrounded by the school (1978) on one side,now to be demolished and Woughton Centre housing Sports Hall, Performance Area and Swimming Pool (shown on left) acting as a community building. There was some modest housing planned on opposite extremities of the education campus to create some mixed use, but the temptation to fill the empty green fields with housing (and once again of terrible layout and design) proved too great and the resulting mess of excessive but lucrative housing, failing schools, (some now pending demolition) and building of a new Academy in a ‘left-over’ corner of now crowded site hardly shows planning anticipation and aptitude of caretaker town planners of this new city. The gloomy picture painted here is an attempt to record some of the disasters and occasional successes, before the haze of time and eventual re-writing of the local history distorts the facts beyond recognition for the future generations. The photograph above showing the wall painting in Woughton Leisure Centre is a work called ‘ Situation Comedy’ painted in 1981 by Boyd & Evans. This was their first commission in MK and was followed by many other. The name reflects the inclusion of some existing building features within the painting, such as stairs and projecting balcony. The blue handrail in photo has an extra bar added, it used to be red as shown in the painting. It worries me that MK Partnership is ploughing ahead with rather shoddily created plans for the Eastern and Western expansion areas before even the existing areas which need attention are in order. Thanks for your comments. I wonder why MK failed to produce or even attempt a single good / innovative housing scheme (apart from RR’s Oxley Wood) during last three decades. If the answer is ‘market forces’, then in my view the current planning body should gracefully resign for the sake of MK’s future. The politicians grasp of importance of environmental issues is completely non-existent and therefore there is hardly any point waiting for rescue from that direction. I suppose all we can do is grin and watch the opportunities disappear gradually. By the way what is the nature of your project in Milton Keynes? It’s essentially a photographic study of the city, dispelling many of the myths but also I’m doing this as honestly as my bias will permit (!) to show where the city has failed, Coffee Hall being one such example. I absolutely agree with your above sentimnents, MK Partnership,, the HCA (or whatever they decide to call themselves next week) and MKC have shown a stunning lack of vision and save for a few moments of hope (e.g. Oakgrove Milliennium Community) it does appear people who do not care and have no real understanding or sight of the future are dictating some very depressing expansion schemes on Milton Keynes. This is why I am doing this study now, before the city that is only now beginning to find its original Plan returning competitive benefits. I do despair for the lack of vision that planners have these days with the crap plans they foist on well designed cities. Seeing how CMK might be destroyed by greed to build on every scrap of space breaks my heart. Maybe someone will get a clue before its too late. Anyway! It is first and foremost a photographic study which is found here: http://www.flickr.com/photos/lilserenity/sets/72157618590943732/ — there won’t be many words in the resultant book. I will try and remember some more details about it’s early life. Contact me if you are interested. Thanks for contacting me. This is a special building, especially to me, as I know the architects and the contractors who built it. It is still a housing association scheme but by the looks of it, a bit neglected and not particularly friendly looking place. It would be nice to know what kind of social contacts you had with your neighbours within this building or on the estate. All the best. I will try and find any photographs I have of the place in the next few days and share them with you via Flickr? I added some comments on your Flickr stream as well. We used to have a lot of social events in the common room and I remember people from the estate coming along because I had a few friends who lived on the estate. A friend of mine and myself built a disco unit and speakers for use at these parties. One of the residents used to sell chipboard in large quantities to local hardware stores and he told us to just ‘help ourselves’ to what ever we needed out of the back of the van! I only lived at Chapter House for about a year before I moved to Albany Court, in Stantonbury. Also owned and run by UKHA and managed Mrs Lee who was the manager of Chapter House. Quite a few people moved to Albany Court when it was announced it was completed so it wasn’t like we were moving in next to strangers! I lived in Albany Court for about 3 years before I bought my own house in New Bradwell. I left Milton Keynes in 1983 to live and work in Cyprus for a couple of years, when I returned I moved to Kent in 1985. Only left there last year to move and live in semi retirement in France. I’ve been contributing to the Hidden MK project as well hiddenmk.com I feature on the page about Channel 40 the Community TV station… I had hair then!! A couple of photos from 1978. Feel free to use them, if you need higher res versions please email me.